Well, we are off on our next global adventure – this time closer to home as we spend 25 days in New Zealand. 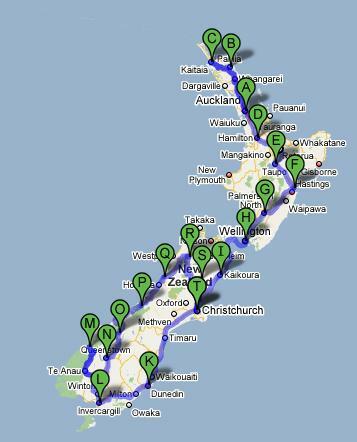 Departing December 27th, we fly to Auckland where we pick up our car and head off, travelling right to the top of the country before sight seeing the North Island as we make our way to Wellington. After our ferry ride to Picton we then begin touring the South Island and return to Sydney January 21st 2008! We are basically following the tour as done by Billy Connolly as part of his world tours a few years ago. We saw his New Zealand tour and were inspired and so have been planning this trip since about July this year. – Participation in some extreme sports including zorbing, canyon swinging and bungee jumping! We hope to also do some walking and Christopher is keen to grab every photo opportunity he can. We are taking a laptop with us so depending upon the availability of wireless internet access, we hope to keep this site up to date as often as possible. We look forward to receiving your comments along the way. Hope you finding the Bay of Islands as beautiful as I remember it 30 years ago.Actually the whole area had just appeared out of the sea that long ago and the dinosaurs were amazing! A short message to Ann while I think of it. I’ve been to the DJ’s Sale and I’ve managed to get some fantastic bargains on shoes. I hope you have a great time in Mauritus). Thanks boys for letting me use your Blog site in this way. Come back with great suntans great photos great souvenirs but NOT the accent.